Ridesharing providers like Uber and Lyft are a mainstay in Louisiana. Uber and Lyft offer safe and affordable transportation. Unfortunately, however, accidents still occur. These accidents may be the fault of Uber and Lyft drivers or drivers that collide with ridesharing vehicles. Whatever the case may be, you are protected as a passenger in a Uber or Lyft vehicle or as an occupant of a vehicle hit by an Uber or Lyft vehicle. Smartphones allow individuals to connect to each other in new and innovative ways. One such way is through ridesharing apps. These apps allow a person who needs a ride to connect with another person who is willing to drive for money. The two main companies providing ridesharing apps are Uber and Lyft and are known as Transportation Networking Companies (TNCs). TNCs have grown immensely due to their ease of use and convenience. In 2017, Uber accounted for over 4 billion rides across the world. In New Orleans alone, drivers for Uber and Lyft provided over 1.2 million trips in 2015. With the increasing number of people driving for and riding in Uber or Lyft vehicles daily, there is a greater chance that if you are involved in a vehicle accident, it will involve an Uber or Lyft vehicle. Uber and Lyft drivers are considered independent contractors rather than employees. For this reason, if you find yourself in an accident as a passenger of one or in a vehicle struck by one, determining who is responsible for your damages can be a difficult process. There are four possible scenarios that can occur, and different insurance considerations come into play with each. The Uber/Lyft driver is NOT logged into the ridesharing app at the time of the accident. The Uber/Lyft driver IS logged into the ridesharing app but has NOT accepted a ride request yet. The Uber/Lyft driver HAS accepted a ride request but has NOT picked up the passenger yet. The Uber/Lyft driver HAS picked up the passenger and the passenger has NOT exited the vehicle yet. Drivers are not considered to be “on the clock” until they have officially logged into the Uber app or Lyft app. This means that a driver’s personal liability insurance policy is the only insurance that is active at the time of the accident. However, since Uber and Lyft require their drivers to carry at least Louisiana’s minimum liability insurance policies, the Uber/Lyft driver will at least have minimum liability limits of $15,000.00 per person and $30,000.00 per accident to cover your damages. An accident during this time will implicate the driver’s personal liability insurance as the primary coverage. Uber and Lyft also provide their drivers with a Limited Liability Policy once they log into the app that will cover whatever the driver’s personal policy does not. This policy covers $50,000 per person and $100,000 per accident for bodily injury. It also covers $25,000 for property damage. In this scenario, Louisiana law requires that Uber and Lyft provide Third Party Liability and Uninsured/Underinsured Motorist Coverage. Each of these has a $1 million of coverage per accident. The Uber/Lyft driver HAS picked up the passenger, and the passenger has NOT exited the vehicle yet. Just like in Scenario #3, Louisiana law requires both Third Party Liability and Uninsured/Underinsured Motorist Coverage to be provided by Uber and Lyft with a $1 million per accident limit. 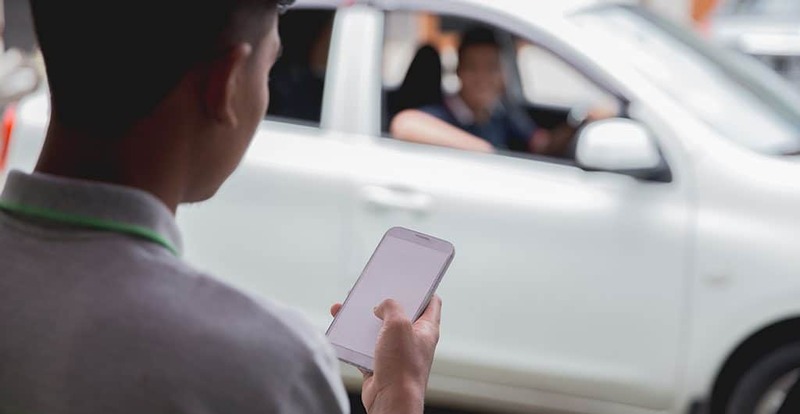 Since working as a rideshare driver requires the use of an Uber app or Lyft app on a smartphone, there is a higher potential that the driver will be distracted by these apps and his/her phone’s GPS navigation system, which could lead to an accident. An accident involving an Uber or Lyft driver may also occur from the driver’s over confidence because people who drive all day long may tend to drive in a risky, aggressive manner. Since Uber and Lyft drivers are independent contractors they are not monitored by a supervisory figure. This could lead to sloppy and risky driving that goes unchecked by a boss. Another potential accident cause is driver fatigue. Although there are limits on the number of consecutive hours a driver can work, there are ways to get around them, like working for both Uber and Lyft in the same day. Passengers riding in the backseat of a vehicle are often less likely to wear a seatbelt. Louisiana requires Uber and Lyft drivers to provide more insurance coverage than taxicabs are required to carry. Although Uber and Lyft need to run background checks on drivers, they are not required to provide them with special training. This means you could potentially find yourself being driven by a highly inexperienced Lyft or Uber driver. Donald D’Aunoy Jr. “Lawyer Don” is a Louisiana Uber accident attorney. His main office is in Metairie, Louisiana. However, he represents clients throughout Louisiana. He makes free house calls to all of his clients at no extra charge. If you or a loved one has been involved in an Uber automobile accident, contact Lawyer Don today for a free case evaluation. Lawyer Don’s main office is located at 1000 Veterans Boulevard, Metairie, LA 70005 on the second floor in suite 203. The office is in the heart of Metairie. However, Lawyer Don makes free house calls to clients within Metairie that do not have transportation or are unable to travel due to their injuries. Lawyer Don routinely represents Kenner victims injured in T-Bone accidents. Lawyer Don’s Metairie office is located minutes away from Kenner. Furthermore, Lawyer Don makes free house calls to his Kenner clients. Lawyer Don’s mission is to make legal representation as convenient as possible for his clients. Lawyer Don’s satellite office is in Harvey, Louisiana at 1901 Manhattan Boulevard, #313, 70058. The office is in the heart of the Westbank. However, Lawyer Don makes free house calls to all clients living on the Westbank that do not have transportation or are unable to travel due to their injuries. Lawyer Don routinely makes house calls to Westbank cities like Gretna, Marrero, Westwego and Terrytown.